Since 1977, the Seattle Aquarium has been dedicated to the conservation of the planet's marine and freshwater ecosystems and to the education of the public. This world-class aquarium is fun and interactive, featuring diverse exhibits and attractions for visitors of all ages. You can make your way through the entire facility in about 2 hours, but really it's best to slow down and spend some time going through the different sections with care and attention. At the end of the day, visit the Gift Shop, where you can take home books on your favorite sea creature or maybe even a plushy or T-shirt. Adult admission (13+): $21.95, Youth (4-12): $14.95, Kids (3 and under): free. Discount of $2 off for seniors (65 ) and those with disabilities, and $2.95 off for active military with ID and their dependents. Open 9:30 a.m .to 5 p.m. daily. Limited hours on Thanksgiving and Christmas Eve. Closed Christmas Day. Open with regular hours during other major holidays. What kind of exhibits can I expect to see? 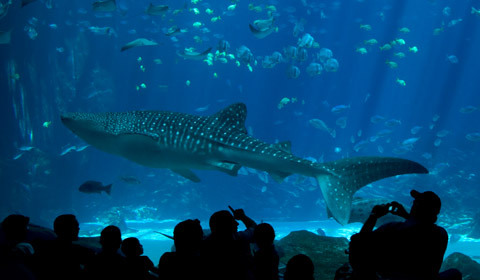 The Aquarium is comprised of different areas based on the various aquatic regions found throughout the globe. Major sections include the Tropical Pacific, Puget Sound Fish, Orca Family Activity Center and Birds and Shores. Windows on Washington Waters is a enormous tank featuring 3 SCUBA diver shows each day, and home to more than 800 fish from the local waters of the Pacific Northwest. Is there a place to eat at the Aquarium? Yes, the Aquarium Cafe is open on weekdays from 9:30am to 4pm, and weekends from 11am to 4pm. You'll find a variety of choices that even the pickiest eater will love, including coffee and pastries in the morning and throughout the day. For lunch, choose from burgers and fries, fresh salads made to order, sustainable seafood, and soups. You can even imbibe a relaxing local microbrew!